Spring is my favourite season of the year. A time which is symbolic of new beginnings; you’re woken up by the sound of birdsong, the flowers are all starting to bloom and the days are getting that little bit longer. 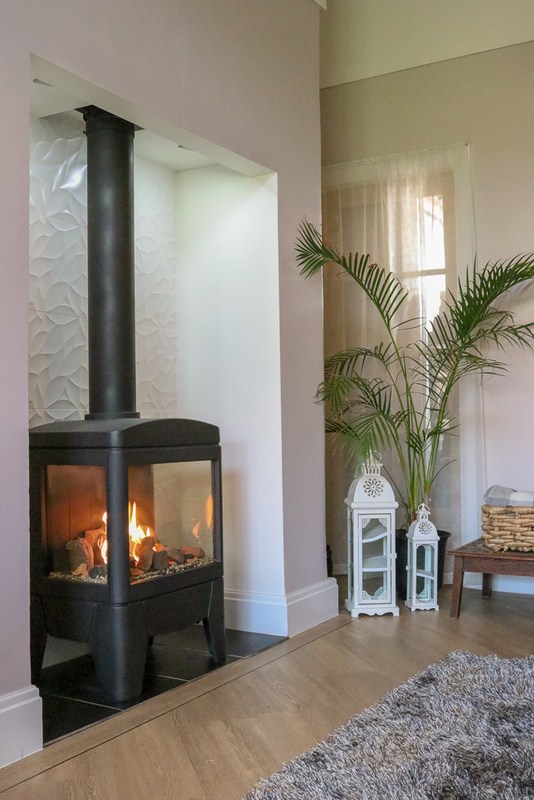 Spring is also the perfect time of year to start planning any home renovation projects and as the days are longer, you’ll find yourself with so much more energy to tackle that massive to do list that you’ve been putting off all Winter! I tend to find myself stuck in a rut during January and February with little motivation to do anything but once Spring arrives I have a new lease of life. I’m sure I’m not the only one that feels this way. After having a tiring week and feeling ill, I’ve caught up on some much-needed sleep this weekend and I’m feeling refreshed and revitalised. I felt like I needed to do something productive with my day, so this weekend wasn’t a complete waste. 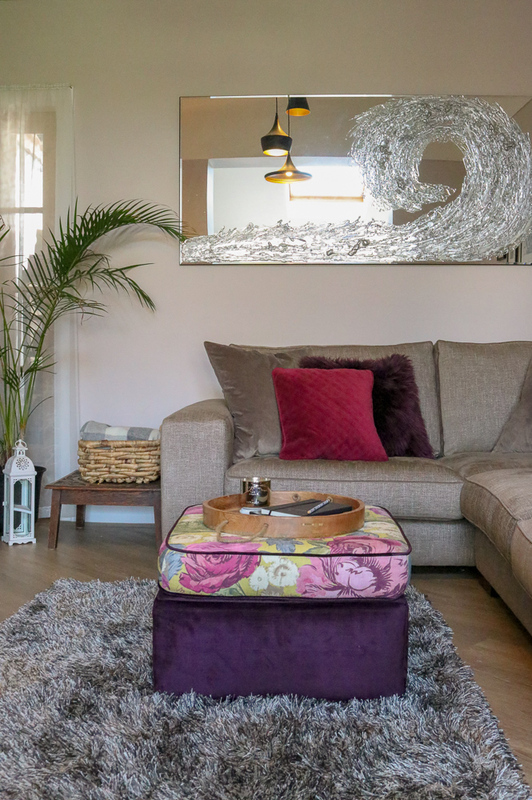 I decided to practise using my camera and style the snug in the open plan extension for today’s blog post. I’ve realised that I need to invest in some lighting equipment because it’s so hard getting good pictures when the lighting is poor indoors. Nevertheless, I still had a good practice and managed to get some ok photos! Here are some home decor tips that I’ve collated for creating a bold and beautiful home interior, ready for Spring. Bring a pop of colour into your home with a statement piece of furniture. Whether that be a statement chair in a bright colour, some bold homeware or a patterned footstool; creating a colourful focal point in your room will brighten it up and give it that much-needed lift for Spring. Bold and bright colours are a big interior design trend this Spring/ Summer, so say goodbye to beige everything and invest in something a little more daring. I’m a big colour lover anyway but it’s great that there will be a lot more striking pieces in stores this Spring/Summer. I had this 27-year-old footstool re-upholstered in a mixture of two colourful fabrics to give it a refreshed look. The base is upholstered in a deep purple velvet and the top cushion is upholstered with a mustard floral patterned cotton fabric with the same purple velvet piping around the edge. The purple velvet was bought from John Lewis and the patterned floral fabric was bought through Stockton’s. I designed this footstool using inspiration from the John Sankey furniture collection. Now the days are much brighter you want to maximise on all that natural light. Place a large mirror on the wall opposite your window or patio doors and this will help bounce the natural light around your room. This mirror duals up as artwork and has a beautiful, delicate, shimmery wave effect worked onto the surface, further enhancing the reflective and light bouncing qualities of the mirror. You can enhance your home by introducing flowers and greenery during the Spring. Flowers add a beautiful finishing touch and make your room look so much nicer and fresh. If you like to have real flowers, I find Aldi’s flower selection is brilliant because they are so cheap and last really long. If you’re like me and tend to be a plant serial killer or you suffer from hay fever, you may want to opt for faux flowers instead. They will probably cost you a bit more for decent quality and real looking flowers but at least they won’t die when you forget to water them! 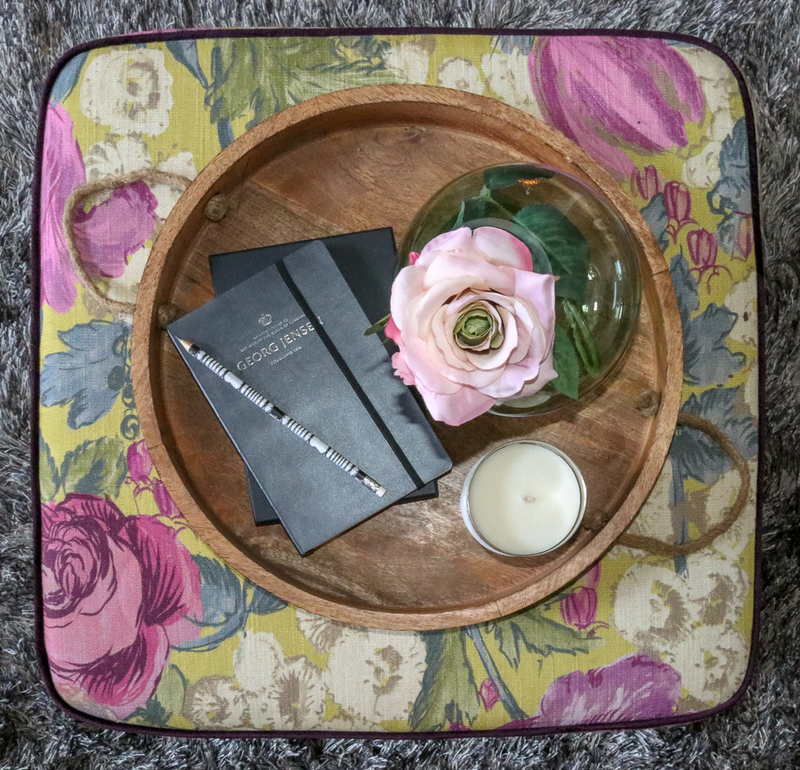 I have styled this natural wooden tray from Homesense with my gorgeous homeware from Amara Living. Simple changes to your existing accessories can be a great temporary solution if you don’t want to buy a whole new set just yet. 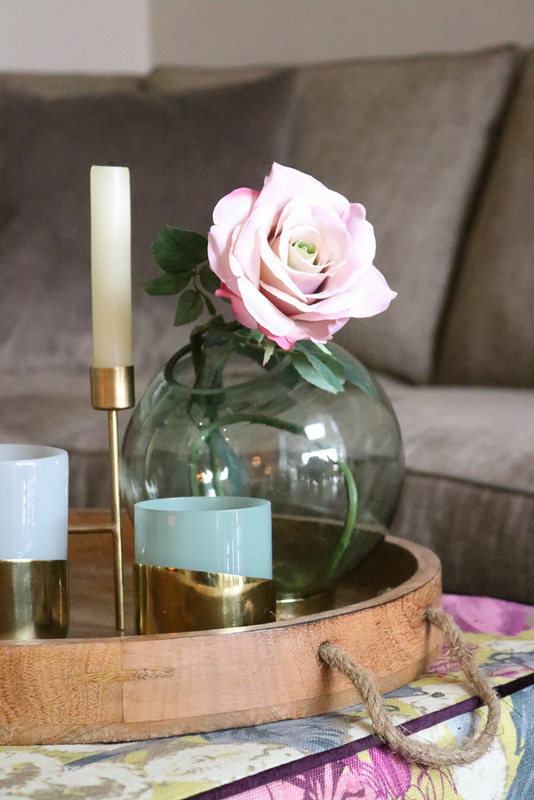 For example, I have swapped the pine cones from this green globe vase with a faux flower pink rose to make it a more suitable look for Spring. I bought the faux flower rose from Dunelm Mill. You can shop my Secret Garden Collection for other homeware and faux flowers suitable for a greenery inspired interior here. Incorporate natural materials into your home decor such as wicker, bamboo, jute and rattan to give your room a fresh and balanced look for Spring. There are some lovely ceiling light shades and baskets made from natural materials available at the moment from places such as Cox and Cox and Homesense. The basket in the below photo is from Homesense. I can’t wait to show you my latest interior design project. I’ve been working on a living room design and home office design prior to Christmas and my client is currently in the process of implementing the proposals. They initially got in touch with me in October and asked me to help them with two of their rooms within their home. 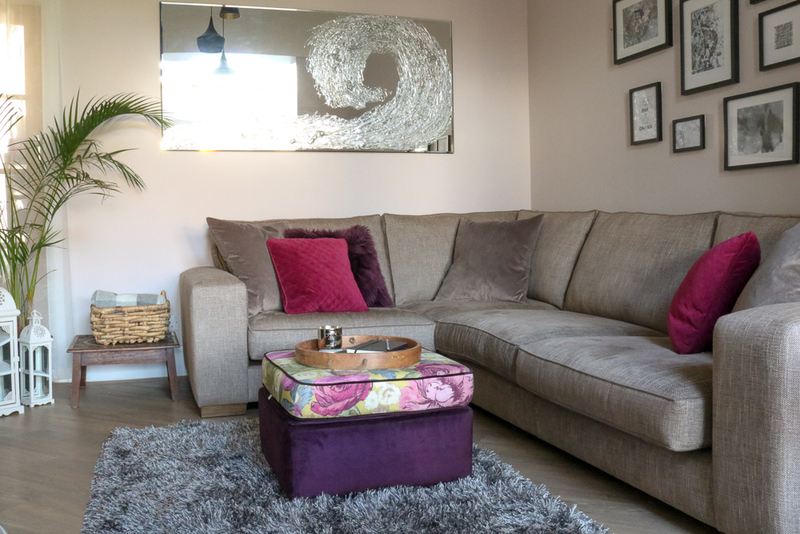 I had a challenging brief to work within a tight budget, make their living space much more sociable and brighter as it doesn’t have any windows and help them create a more modern, stylish and uncluttered office space. I had to make use of some of the existing furniture whilst complementing new pieces into the scheme to create a newly refreshed look. I specified this gorgeous Jute lampshade from Cox and Cox for their ceiling light in the living room paired with a braided brass lighting flex from B&Q. Stay tuned for the full room design reveal. The project is coming up to completion and their new sofas arrived last week. Hopefully I will be catching up with them soon, so I can take some photos of the finished rooms to share with you! Thinking of doing up your home but haven’t got a clue where to start? Have a look at the interior design services I offer here. Make sure to subscribe to my newsletter if you want to receive my latest blogs direct to your inbox. If you liked this post please share! Disclaimer: This post contains affiliate links and I receive a small commission when you buy through clicking on the link. Tell me about it. It was snowing in Liverpool today! Great tips. I love all the natural materials around at the moment and they look so good alongside all the greenery. Spring is my favourite season and that feeling of new beginnings should definitely be maximised in the home. These are great tips, especially love the mirror doubled as artwork. Great tips and lovely photos too. Nice to see some stronger colours alongside all the spring pastels. Great tips and I am always into bringing in flowers and bold, bright colors for spring! Glad to see you mention faux flowers here! I am becoming a BIG FAN of faux flowers and it’s really paying off! I come home and see a beautiful arrangement, it takes some seconds to register they are faux! no more watering or buying new!